Twirl Radio Presents: The Cherry Bluestorms, Anton Barbeau, and Crooked Flower–live at The Starry Plough in Berkeley, CA, 9/26/2015! Coming soon: our first live Twirl Radio Presents show in over a year! And we’re back with a vengeance. 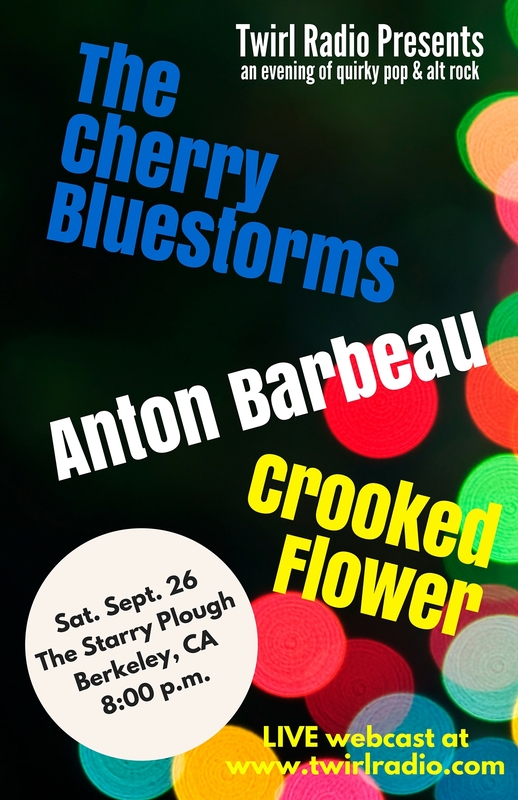 The Starry Plough in Berkeley, CA is going to be rockin’ hard with L.A.’s The Cherry Bluestorms, the legendary Anton Barbeau, visiting from Sacramento by way of Germany, and hometown East Bay rockers Crooked Flower. The Cherry Bluestorms, featuring the captivating vocals of Deborah Gee and guitar mastery of Glen Laughlin (formerly of The Dickies), bring the best of psychedelic pop to the stage. They’ve got one of the most intense shows you’ll see this year. Anton Barbeau, whose UK band features former bandmates of Robyn Hitchcock, presents his own strain of psychedelia, peppered with witty lyrics and fun stage banter. And Crooked Flower, featuring Angie Dang’s soulful vocals, will lock us into an unforgettable groove, while never forgetting that we came to rock. Mike Lidskin of Twirl Radio will introduce the bands, and there will be a live webcast of the entire show right here at http://www.twirlradio.com. It would be great if you could come join us in person. Twirl Radio Playlist – Show #699 – 9/19/2015: Twirl Radio Presents preview: Interviews with The Cherry Bluestorms, Anton Barbeau, Crooked Flower! Twirl Radio’s 700th episode this Saturday, October 3rd, 2015!